Ariel Kachuro/Assistant Photography Editor Binghamton Mayor Rich David recently saw his property tax assessment decrease by $47,700 for his personal residence at 45 Court St.
Binghamton Mayor Rich David saw his property tax assessment for his personal residence at 45 Court St. drop by $47,700 for 2018. While David broke no laws while obtaining the assessment and followed standard New York state procedures, some constituents question the ethicality of the method he used. The change reduced David’s assessment from $179,000 to $131,300. According to an assessment complaint form filed with the city tax assessor’s office on March 22, the assessment was reduced because of “income and expense.” David said he previously had an Empire Zone exemption, a type of tax credit, for 45 Court St. that expired in 2018. When he saw the new assessment for his property, he had questions regarding whether it was overassessed. According to David, when he initially contacted the assessor’s office and filled out the form, he had already researched the assessment process, and wanted to be as transparent as possible. Following the law is important for elected officials, according to Jonathan Krasno, a professor of political science at Binghamton University and a resident of Binghamton. But Krasno noted that appearances also matter for politicians, especially in situations where they could have undue influence. Property tax assessments can be reviewed in a variety of ways: there’s the market approach, in which assessors compare a property to similar properties that have recently sold, and there’s the cost approach, in which assessors determine how much it would cost to replace a structure with a similar one using current labor and material prices. But Scott Snyder, tax assessor for the city of Binghamton, said that for David’s tax assessment he used the income approach, which is generally used for commercial and mixed-use commercial buildings such as 45 Court St., a three-story building that sits on approximately 0.03 acres of land. Using the income approach, assessors determine how much income a property will produce if rented, considering operating expenses, insurance and maintenance costs. Snyder said he factored in what David initially paid for the building, how much money he put into the building in renovations and how much income David could generate from renting it. A deed of sale for the property from September 2006 shows that David paid $100,000 for the building and the land it sits on. David later applied for building permits and put roughly $95,000 toward renovations on the second and third floors of the building. Although David only rents the first floor of the building and uses the second and third floors as his residence, Snyder said his assessment considered the income David could potentially receive for all three floors if he rented them out. A similarly sized, three-story property located on the same block as David’s residence, 29 Court St., is currently assessed at $140,000. Shortly after David’s assessment was reduced, Tarik Abdelazim, 45, a resident of Binghamton and a former Democratic mayoral candidate running against David in 2017, discussed the reduction in a post published on Binghamton Bridge, a local news blog that works to “amplify local progressive activities,” according to the website. In his post, Abdelazim wrote that David had failed to use official channels to get his assessment reduced, because he had not filled out Real Property Form 524. After the tentative tax assessment roll in Binghamton is released each year on May 1, the city tax assessor cannot change property assessments for the current year. But David filed his assessment complaint in March, before the tentative roll was released. This constitutes a period in which Snyder could legally make reassessments to properties, since New York tax assessors are required to assess all real property at a uniform percentage of market value each year, according to New York Real Property Tax Law Sections 301 and 305. Therefore, David was not legally required to file a formal grievance, or fill out Real Property Form 524 and appear before Binghamton’s Board of Assessment Review (BAR). The board handles contested tax assessment cases and consists of five members who are appointed by the mayor to five-year terms and confirmed by the City Council. According to Snyder, the law is designed to ensure that tax assessors can make changes to tax assessments before the tentative tax assessment roll is released, so when they submit the tentative roll, they can defend those assessments to the BAR. According to Snyder, his office assesses property valuations from March to May, and all owners have the opportunity to request that he review their assessments during that period. In his blog post, Abdelazim also wrote he was concerned about Snyder’s involvement in the assessment reduction, as Binghamton tax assessors are appointed by the mayor to six-year terms. Snyder was initially appointed as city tax assessor in 2008, to fill a vacated term, by former Binghamton Mayor Matthew Ryan, and was appointed again by Ryan in 2013. He is up for reappointment in September. Considering Snyder’s impending reappointment, Krasno wrote that David could have considered filing a grievance and appearing in front of the BAR — even though he wasn’t legally required to do so — which would have required him to publicly submit documentation in support of the reduction. But David said he went to Snyder in an effort to follow the same procedures any other resident would while seeking a reassessment, and didn’t consider appearing before the BAR because he never intended to challenge the assessment once Snyder finalized it. Snyder said David could have gone before the BAR, but was not legally obligated to. According to Snyder, the assessment reduction was transparent. “This was handled with full transparency, knowing how the assessment calendar and procedures are done,” Snyder said. He also said his office operates autonomously from the mayor. It is not the first time David has seen criticism from residents concerned with the ethicality and transparency of his actions while in office. In October 2018, he came under fire after accepting an all-expenses-paid trip to Las Vegas from a local businessman, which some constituents claimed violated Binghamton’s Code of Ethics. In a public statement, David wrote that he had a longstanding friendship with the businessman, and that the trip was not related to his position as mayor. During the 2017 mayoral election, he faced criticism when a Pipe Dream investigation revealed his campaign had changed headlines on more than 20 news articles from local media outlets before posting them on his official Facebook page. Later, in a statement, David wrote his campaign “could and should have done better communicating our message” over social media without changing the headlines. David also recently transferred ownership of 45 Court St. from one of his incorporated investment companies to his name, to bring it into compliance with the New York State School Tax Relief Program, or STAR exemption, which he has received since 2014. 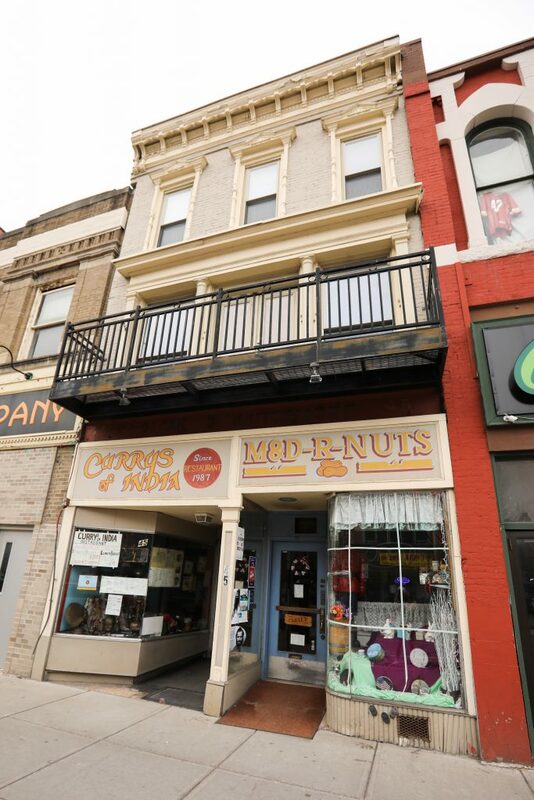 In addition to 45 Court St., David owns five other properties within city limits, including three vacant lots along Washington Street in Downtown Binghamton and two commercial buildings on Clinton Street. The properties were each purchased under one of two different investment companies David has incorporated: Confluence Clinton St., LLC and Confluence Enterprises II, Inc. David has not purchased any additional commercial properties while serving as mayor, adhering to a pledge he made during a March 2017 interview with the Press & Sun-Bulletin. Krasno wrote that he understands why David would want his property reassessed, as Binghamton has not had a municipal-wide reassessment since 1993. Still, he wrote that it’s also understandable why a tax reduction can be seen differently when elected officials are involved.